this post is sponsored by Asennemedia & Urtekram. As I mentioned before, I’ve had a huge craving for pancakes during the last few months, or actually from the beginning of my pregnancy (so that makes it about 7 months already!). 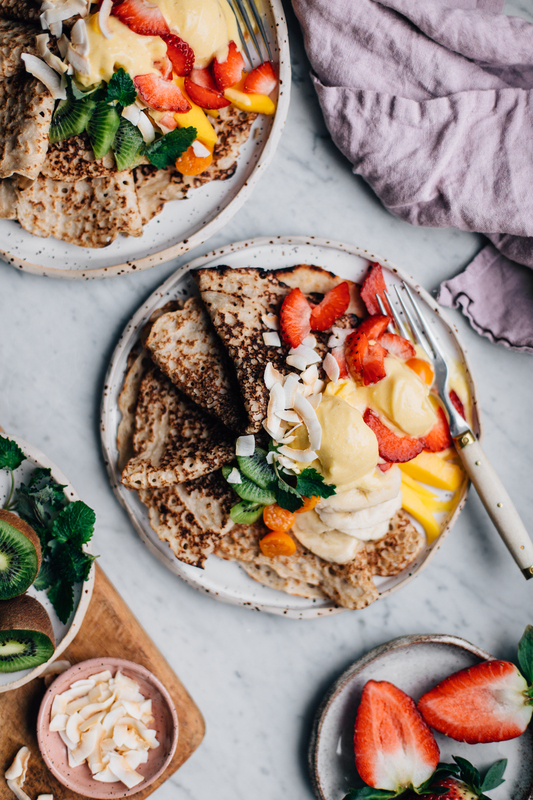 Especially during the first trimester my go-to breakfast was a gigantic and very thick banana pancake with berries and fruits, which was both a delicious way to start the day but also a momentary cure for my morning – let me rephrase that – all-day sickness. 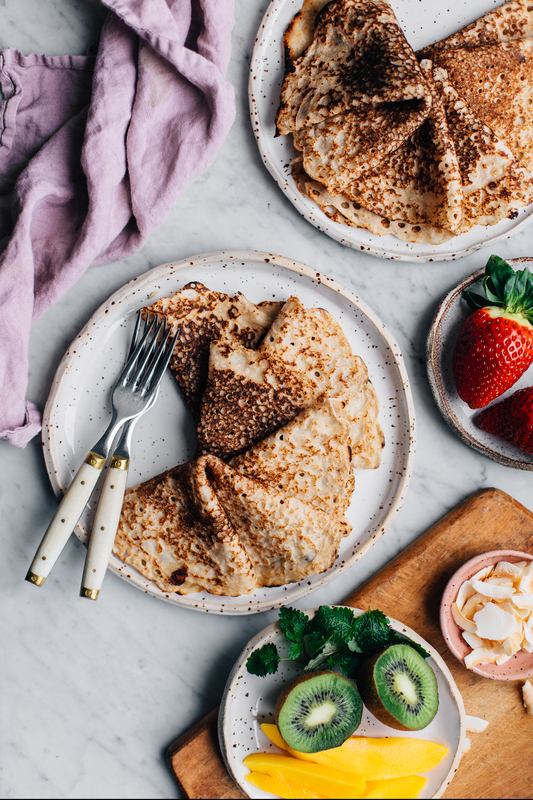 But after having my share of the thick pancakes, I found myself in the mood for thinner pancakes, like crepes, and for all the tropical foods our nearest grocery store carried. So to balance out the winter vibes all around, I whipped up a batch of coconut pancakes and made a super quick mango nice cream to treat myself properly. And then I ate five pancakes, two scoops of ice cream, and a huuuge amount of fruits with a satisfied grin on my face. They say eating for two while you’re pregnant is a myth and unnecessary, but maybe that doesn’t apply to pancakes. Or nice cream. Or to me. Oh well, who cares, as it was all worth it and I’d do it again. Besides eating huge piles of pancakes, one of the benefits of being a food blogger is that I get to try a lot of new products before they hit the stores. 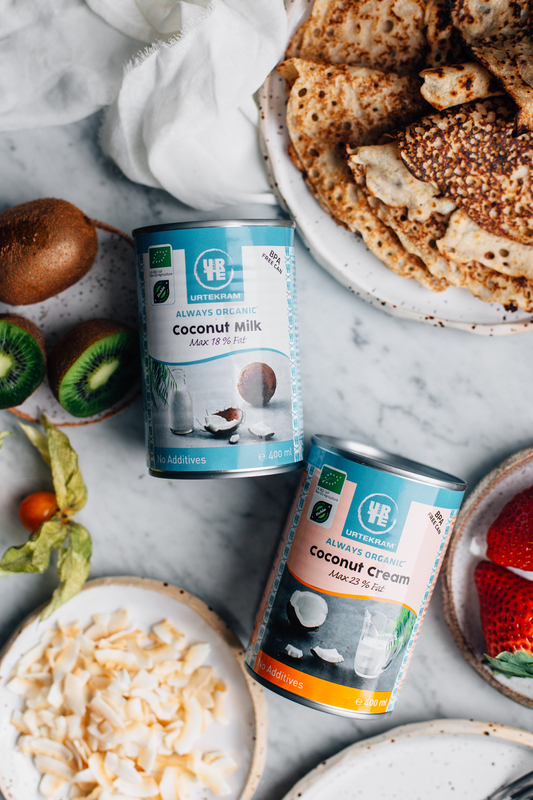 Like the two things I got from Urtekram for this collaboration: their new organic coconut milk and organic coconut cream. I always have some coconut milk in my pantry, since I think it’s such an easy dairy-free replacement for cream, and I like using it both in savory and sweet recipes (and on top of my pancakes!). A lot of the cans in the market have different additives in them, but these both are free from additives, they’re organic, and the cans are BPA-free. So if you’re a coconut addict like I am, it’s pretty nice to have a ‘cleaner’ version finally in the stores! As a true coconut fan, I tried both the milk and the cream: I used the coconut milk in the pancake batter and the cream in the nice cream. The coconut milk is slightly runny and replaces regular cooking cream well, and the coconut cream is thicker and thus good for desserts, and especially ice cream! Before jumping to the recipe, just a few words about the pancakes. If you’re not a fan of coconut, don’t worry. The taste of coconut is super mild in the pancakes and mostly brings a nice twist to the batter. 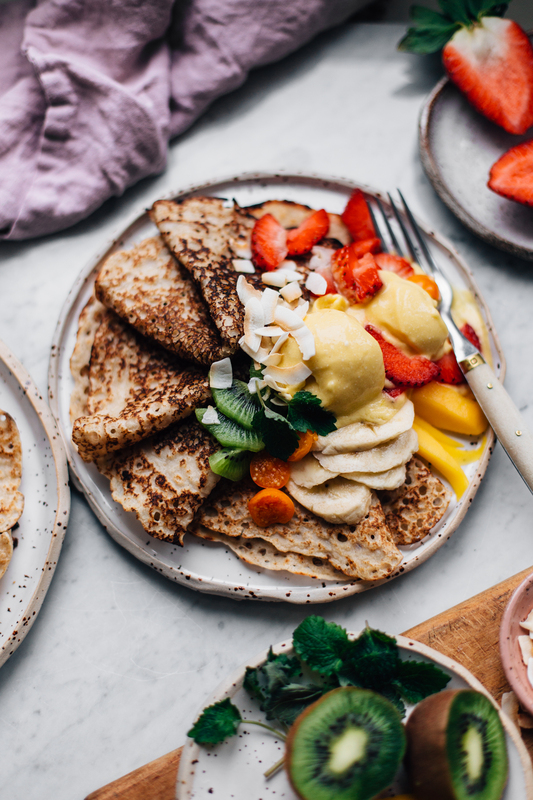 So you might even like it :) And the mango nice cream comes together from only three ingredients (frozen mango, frozen banana & coconut cream) and is a great topping for the pancakes if you’re in the mood for something tropical. And to make sure things get a little out of hand, I recommend chopping a bunch of fruits and berries on top of the pancakes. Or you could top the pancakes also with homemade jam, cashew cream, shaved chocolate, or nut butter…just to give a few examples. Really, the sky is the limit when it comes to treating yourself. notes: the batter should be quite runny as you want these pancakes to be pretty thin. if the batter seems toot hick, add a bit of sparkling water. if you’re not serving the pancakes straight away, I recommend putting a kitchen towel on top so that they’ll stay soft and not dry up. 1. Measure the oat flour, rice flour, coconut sugar, and salt in a large bowl and mix well. Add coconut milk and sparkling water and mix thoroughly so that no clumps remain. Let the batter rest for 15 minutes. 2. Heat a frying pan and add a small drop of coconut oil to the pan. Measure about 3 tablespoons of the dough to the pan and spread to a thin layer. Fry on medium heat until bubbles appear on the surface of the pancake and it starts to dry up. Turn and fry the other side. Prepare the rest of the batter in the same way. 3. Once the pancakes are ready, serve them with mango nice cream, fresh fruit, and toasted coconut flakes and enjoy! Add the banana and mango to a blender. Scoop three tablespoons of the white thick paste from the coconut milk can and add to the blender. Start blending on low speed and then slowly add more speed once the fruits start to crumble. You may need to scrape down the sides of the blender a few times until a smooth consistency is achieved. Once the nice cream is done, scoop into balls and serve! Tagged dessert, ice cream, nut free, oat, pancakes, treats, vegan. N’Ice Cream – Breaking the News! This Inner Glow Juice is made with sweet potatoes, carrot, apple, mandarins, and fresh ginger. It's loaded with nutrients and makes you feel glowing inside and out! This Chickpea Flour Pizza really is the easiest one I've made in ages. No kneading, no messing up your hands in dough. Just choose your favorite toppings and you're good to go! Hi! Do you use brown rice flour or white? Would it be possible to use buckwheat flour instead, and if yes, would I need to change the amount? Thanks!